USGS conducts studies to analyze and interpret water-resources data for specific Federal requirements or to meet the needs of our governmental partners. However, most applications of data are the responsibility of users. USGS does provide some general tools, listed below, that may be useful for applying its water data. In some cases, other Federal agencies or our data partners have provided tools or documented procedures that may help to analyze, interpret, or apply USGS water data for particular applications. At their request and to help you make better use of the data, we have added the following links to their tools. The USGS does not recommend or endorse any tools or procedures that are provided by others for the analysis or interpretation of water-resources data. Users are urged to carefully read the appropriate documentation and any limitations for their use. Water levels in streams, lakes, and wells are used to evaluate the the status of floods and droughts. USGS produces flood and high-flow maps that show current conditions for the USA and for each state. Data for specific sites can be compared to long-term historical conditions. USGS produces below-normal streamflow maps that show current conditions for the USA and for each state. Data for specific sites can be compared to long-term historical conditions. Water levels in streams and lakes and water temperatures are often used by outdoor sports enthusiasts to plan activities such as boating, kayaking, canoeing, and fishing. Planning to paddle? Check these safety tips from the U.S. Coast Guard to ensure that you have an enjoyable trip. USGS water data are used in many software systems to analyze water-resources conditions. USGS distributes published water-resources applications software at no cost. Please note that many of these are for advanced applications and will require specialized expertise. 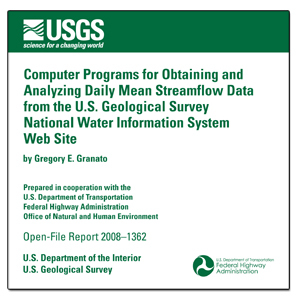 USGS has also produced software specifically for Computer Programs for Obtaining and Analyzing Daily Mean Steamflow Data from the U.S. Geological Survey National Water Information System Web Site.